The iTunes Store is Apple's one-stop shop for everything digital. You can buy music, movies, TV shows, apps, books and more. You can rent movies, and you can download podcasts and iTunes U content. While the iTunes Store is pretty easy to use, there are some tips and tricks you can use to make your experience better. Here's a complete guide to getting the most from the iTunes Store. The iTunes Store has always been an integral part of iTunes, and, with iTunes 12, it is even more intertwined with the overall interface. No matter what type of content you look at in iTunes, you'll see an iTunes Store button in the central navigation bar. Once you're in the iTunes Store, to switch among types of content—music, movies, apps, and more—you can use the leftmost navigation buttons. 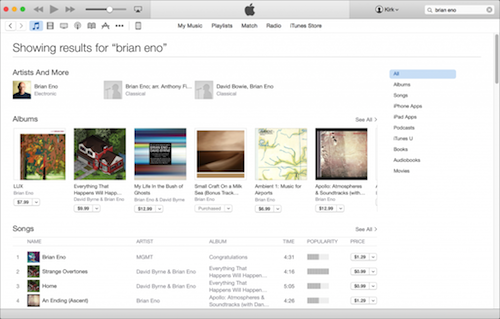 Click, for example, the music button to go to the iTunes Store's Music section. 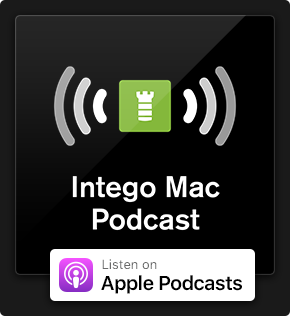 You can also click the large media kind word in the sidebar at the right of the iTunes Store window—clicking, say Music or Movies—to choose another media kind to browse. When you're in the iTunes Store, each media kind "department" offers a choice of genres. Near the top of the sidebar, click All Genres or All Categories (the iTunes Store uses the two terms for different kinds of media) and select the genre you want to view. It's easy to search the iTunes Store: just type a name, or some keywords, into the search field at the top right of the window. Press Return, and the iTunes Store displays a page with search results. You see the most common results first—in the screenshot above, Brian Eno's albums and songs show up. If you search for an author, their books will be prominent; if you look for an actor, you'll see their films, and so on. A sidebar at the right lets you choose other types of content. But there are other ways to search the iTunes Store. The iTunes Store Power Search gives you access to a search interface with multiple fields. So you can search for, say, an album by genre and title, or a movie by actor or director. This Power Search is, however, hidden. There used to be a link to it in the footer of iTunes Store pages, but Apple removed the link back when they released iTunes 11. Nevertheless, if you know the secret link, you can still use this search form. Click itms://phobos.apple.com/WebObjects/MZSearch.woa/wa/advancedSearch and iTunes will open to the Power Search interface. There's another way to search the iTunes Store that can be a lot more practical. When you search the iTunes Store, you only have a single window, which makes it complicated when you want to see content in your iTunes library as well as in the iTunes Store. But the iTunes Store is merely a set of web pages - millions of them - that display in iTunes, as if iTunes is a sort of web browser. As such, you can search iTunes on the web and view the results in your browser. Just run a search, restricting it to itunes.apple.com. You'll get a list of search results in your browser, most pointing to Miles Davis' album In a Silent Way. Searching like this can make it a lot easier to sort through multiple search results without the annoyance of going back and forth among pages in the iTunes Store. If you click one of the links in the search results, you'll be taken to the iTunes Store. But you can also view the iTunes Store pages in your web browser, if you use Safari. The free No More iTunes Safari extension blocks these links; instead of them switching to iTunes, they open in Safari, and you can view the contents of a page in the browser. You can even play previews of songs; just hover over a song and click the play button that displays. 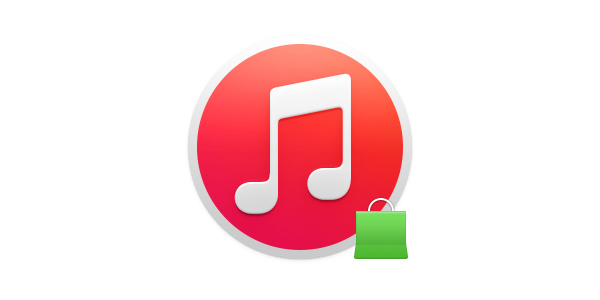 It's easy to buy from the iTunes Store, and that's one reason why it's so successful. Just click the Buy button, enter your password, and your content starts downloading. For free content, Apple recently changed the Free button to Get. This is because of the many "free" apps that have in-app purchases. Such apps aren't really free. You can pre-order some items; if an item is available for pre-order, you'll see a bright orange Pre-Order label instead of Buy. If you pre-order an item, it'll be available for download on release date, and you'll get an email telling you so. You can also gift items. You can do this for music, movies (but not rentals), TV shows, apps and more. To do this, click the arrow next to an item's price and choose Gift this item. And, if you have kids, you might want to set up allowances for them to buy music, apps and more. Read How to Set up and Manage iTunes Allowances for Your Kids. You probably know that you can re-download content you've purchased from the iTunes Store. To do this, click your name in the iTunes toolbar (when you're signed into your account), and click Purchased. 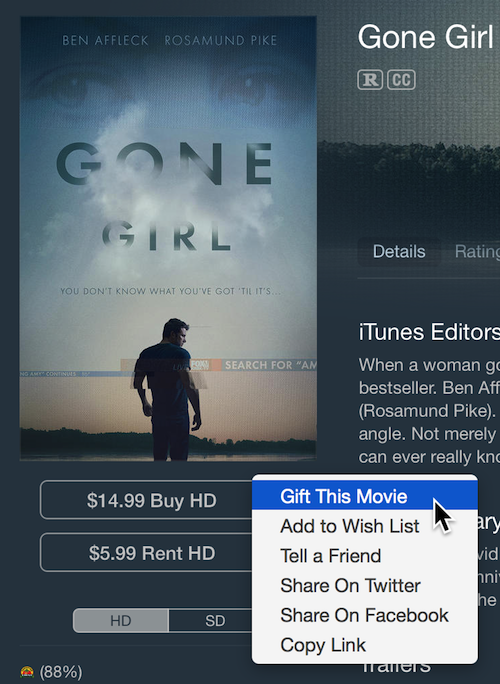 You'll be able to choose which type of content to view, and whether or not it's in your iTunes library. This is pretty simple, but there's one thing you need to know: you cannot re-download all purchased iTunes Store content. You can re-download Music, Movies, TV Shows or Apps, and you can download ebooks from the iBooks app. But you cannot re-download audiobooks or tones. If you've purchased either of these types of content, make sure to have backups. Also, some iTunes Store content disappears; I've seen this for a handful of albums I bought in the early years of the iTunes Store. So it's a good idea to back up all your purchased content anyway. The iTunes Store is a great way to buy digital content. 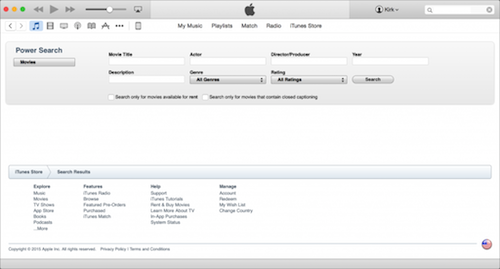 With these tips, you'll be able to use the iTunes Store more efficiently. New to Mac? Let's get you started on the right track! Want to get the most out of your new MacBook, iMac or other Apple computer? Whether this is your first laptop or you’ve just switched from Windows, there are a few things you should know about your new Mac, like basic keyboard shortcuts or how to use the various features macOS has to offer. 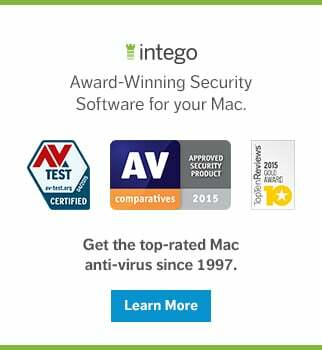 Learn more about what your Mac computer can do for you at the Intego New Mac User Center: Get started now! This entry was posted in How To and tagged iTunes, iTunes Store. Bookmark the permalink.